When we hear the term quantum physics, the first thought that comes to our mind is Einstein and his theory of relativity. Of course, it goes without saying that there is much more to quantum physics than that. Physics is an excellent medium of explaining a million different things starting from heating a cup of coffee to gravitational pull. There is no real limit in the discipline of physics. It involves matters that are as huge as the galaxy to things as small as neutrons. This audiobook deals with the smallest side of it, which is the branch of quantum physics. 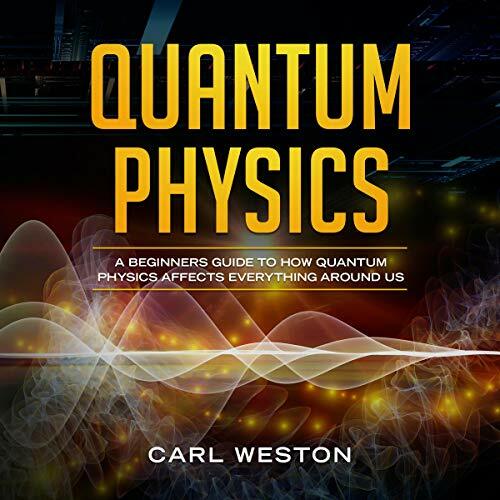 Throughout the course of this audiobook, you will get a much better understanding of quantum physics starting from the basic concepts to some in-depth information. You will also see a lot of math and calculus in the audiobook since quantum physics uses many concepts from those subjects. Don’t dread listening through, even though it might sound dreary and difficult. I don’t intend to scare you with big equations and calculations, as this audiobook will not make you a physicist. The sole aim of this audiobook is to simplify quantum physics for the common man who has no idea what it entails and how it affects our everyday life. I have put the audiobook together in a way that should make the subject matter much simpler to understand and maybe interesting to someone who normally hates science. I assure you that by the end, you will have learnt more than you normally do by just staring blankly ahead in a classroom. If you are a curious student, you will definitely know more about quantum physics than before. This book is meant for those who have a very basic knowledge of chemistry and not much more. The author does break down quantum physics so it is easier to understand without having to be a mathematician or physicist. The only complaint I have is the structure of the book. I think it should have been edited better, helping the author to properly communicate his knowledge. I found it interesting to listen to. Since I have watched The Big Bang Theory and it piqued my curiosity about physics I found this book to help. I have a hard time understanding science (and my husband will totally back me up on this) and this book did help to clear up a few things for me. So if you are looking to maybe understand or learn a bit about quantum physics then you should check out this book. The narration is done well. Jason R Gray has a nice and clear voice. He read at a nice pace and helped to bring the world of quantum physics to those of us who aren't scientifically inclined nicely. I would have liked a better structure to this book since I felt it went from one thing than to another. You do need to have your brain engaged to understand what the author is saying. But it is a book that makes you think. You do need a little knowledge in chemistry like understand what an electron, newtrons, particles, etc are since they are mentioned without being told what they are. Otherwise you will not get far before you loose interest. Loved the narrator, he had a clear voice and was easy to understand. This book gives a history of quantum physics and takes complex theories and explains them in an intuitive and simple way. It addresses several major theories, paradoxes,and practical examples of the utility of quantum physics. The book does not seem well structured to me. I am sure that the order that different theorems and paradoxes are introduced in makes sense to someone already in the community of quantum physics. But as a newcomer this felt less like a guided structured introduction to a subject, and more like an unprepared lecture on a subject by a complete expert. The author comes off as very knowledgeable on the subject. But it is clear that his background is academic, and not in communication. And I feel the book could have benefited from more editing in order to better structure the book. And in order to better reach the target audience. I often felt that the author told me what to feel and think about quantum physics, but not why he thought I should think or feel that. All in all this book did give me a short introduction to quantum physics. It did make me curious about the science. And it did make me able to understand way more references made it The big bang theory. But I am left feeling that with better editing, this book (and this author) would have been able to communicate much more and/or much more clearly. The book started bout broad in it approach and gives you a mile up view. But it breaks everything down and explained in step by step details. It covers the Quantum Physics for the beginner rather well to help the listener understand it better. I recommend a listen.